Ashburton Grove - Arsenal news and Arsenal opinion: Vermaelen out for the season? Szczesny signs deal - Bojan to join? Vermaelen out for the season? Szczesny signs deal - Bojan to join? A very quick round up of the stories making the newspapers today. 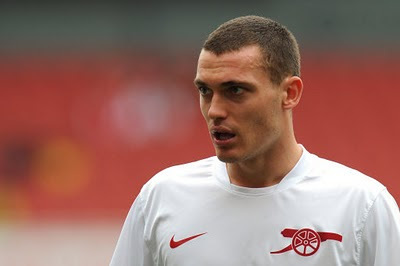 Arsene Wenger said on Tuesday he would not put a time scale on Thomas Vermaelen's return to first team action and the Daily Mirror are reporting the defender could be out for the season. The 24-year-old has told medical staff he feel pain in his Achilles when he tries to run for any considerable length of time. The manager has sent him to see specialists after scans showed there was no scars or long term damage. It remains a mystery but the Belgium defender has pulled out of training three times because of the issue. If Wenger's worst fears are confirmed and Vermaelen cannot return this term, he'll have to look to make a new signing in January, unless he believes 20-year-old Havard Nordtveit is ready to step up to the first team. Another option might be 19-year-old Kyle Bartley but both are considered raw. However Wenger's biggest transfer problem should he need to buy a defender would to find a top class replacement for Vermaelen who's not already cup tied for European football. There appears to be good news on the contract front for Arsenal as rumours circulating yesterday about Wojciech Szczesny signing a new deal appear to be true. The Daily Mirror say the young goalkeeper will put pen to paper on a new five year deal to remain at the club. Szczesny now appears to be above Manuel Almunia in the pecking order. That seems to have convinced him to stay at the club. It's great news if confirmed, as Szczesny looks to be an excellent goalkeeper should he fulfill his potential. Watch the official site for an announcement in the coming days. Another weird piece of transfer news originates from the Daily Mirror. They say Barcelona attacker Bojan Krkic might leave the Spanish club next summer, with Arsenal being one of his preferred destinations. Is this a piece of contract brinksmanship? I very much think it could be. Add another few thousand euros, his agent will tell Barca and he'll sign on for you. Can't see it happening myself. And finally The Sun report we're in the running for PSV winger Balazs Dzsudzsak along with Spurs and Liverpool. A fee of £4 million is mooted.